I have become too busy lately. Busy with work, with the never ending needs of a growing kid, with chores that now I have to do single handedly as Hubby seems never to be at home. Either he is travelling or coming home at midnight. With these we have some added responsibilities that we never had to take care of before as we were away. Am not complaining a single bit as this is how life should be and thank God I have trenmendous support from my Brothers. But life is hectic and sometimes I feel exhausted. I am a kind of a person who needs sometime for herself. Give me 15 minutes for myself and I would be recharged. Remember this post where I talked about my 'Me time' with chai, cookies and books. Thats how it is till date, the only change is now I prefer coffee. With the constant visits from family and friends and with so many cups of 'chai' been guzzled down I hardly crave it anymore. So my new found 'me time' companion is my South Indian filter coffee. Sometime black, sometime latte. With this I prefer some home made cookies. Not those buttery chocolaty ones but something healthy, something easy with some rustic flavours. I really do not like to stuff my shopping bags with those overtly priced so-called fat free, gluten free, cholesterol free and don’t know what else snacks from the super market. Rather I prefer to make them at home. I have recenty started experimenting seriously with whole wheat flour and these cookie bars that I adapted from Sunita’s blog are a real winner. These are enough to convert anyone who doesnot believe in whole grain baking. Simply try this once and you would be convert for life…just like my father and husband. Who always believed that cookies could never taste good without APF, now they are advising me to seriously thinking of opening a cookie shop. Yes these are that good. Toast oats on very low flame till a nutty aroma rises (5-7 minutes). Keep aside. Similarly toast nuts till lightly golden. Cool and chop in small bits. Chop candied gingers, dried apricots if using. In a big bowl mix flour, cornmeal, sugar, nuts, ginger bits and raisins. Mix well. To this add the butter and oil. Mix to form a dough. If required add a few drops of milk. The dough should just come together, not smooth. Take this in a piece of cling wrap. Flatten into a 3” wide, 1/3” thick log. Cover and chill for 4-5 hours. Before baking preheat the oven at 180C. cut 3” long strips. Place them on a greased baking tray. Bake for 15-17 minutes or till the sides are brown. Enjoy your guilt free treats. sending this to Sanjeeta's WWC: Cornmeal for Breakfast hosted this month at Anu's healthy kitchen. oh dear, can imagine how busy you must be feeling. Just take good care of yourself too. The Me time is a must in everybody's life and I am glad you manage to get some .. if not a lot! These cookies looks lovely and perfectly baked. I love anything that has a bit of ginger and this cookie bars are tempting me. 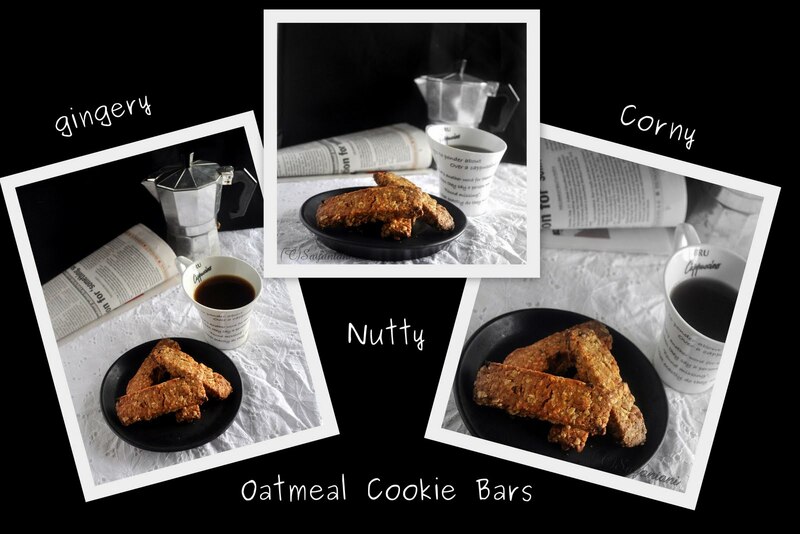 Healthy and delicious bars..Loved the recipe and pics too.. The same story is with me as well as my husband too stays out for work during most part of the week. Also not to mention my little one keeps me in my toes. Also the bars are the right food to pep me up. BTW Ami Pujo te Kolkat aaschi. Jodi shob thik hoye to dekha hobe. Take care. A me time is certainly needed and what perfect company than these bars and coffee. Unusual combination of whole wheat, cornmeal, ginger .... but trusting your cooking skills they must have turned out wonderful. The cookies look a lot like the Italian biscotti. Thansk everyone for liking my me time cookies. @Kankana, yes thats very imporatnt. @Deepa, er cheye bhalo khabor ar hay na. khub siggiri dekha habe. @lubn spoonfuls, thanks for your visit buddy and for your encouraging words. yes this is healthy and yummy too. @Madhu, yes they look like biscotti but definitely healthier than that. 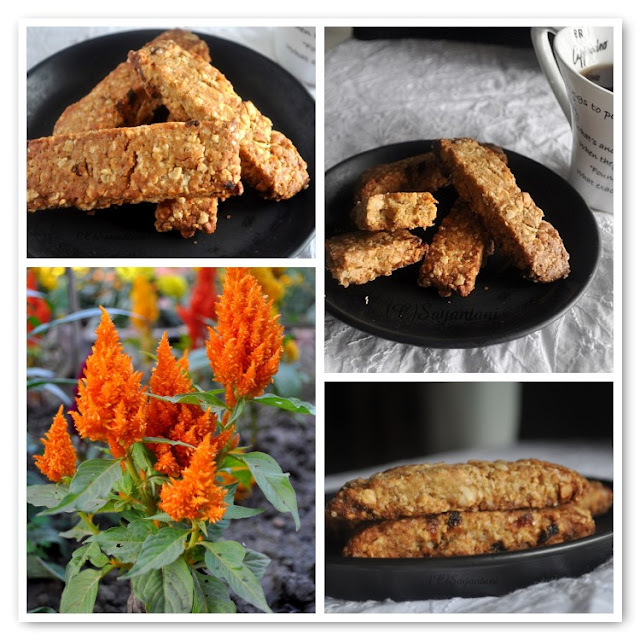 healthy crunchy bars n lovely clicks! Awesome, love the ones with ginger...Your coffee cup is too cute...Its nice to be so busy, I have had an overload of 'me time', want to get back to having a busy life !!! These crunchy bars look so delicious. A delicious blend of flavours. Loved the first click! The cookie bars looks like a one healthy delight!! Oh Arch it's 'the grass is always greener on the other side'. but seriously need some time for myself. Wat a healthy bars to munch without any guilt,seriously i dont bother to have some rite now.. These look real good. I came to answer your question about the pie crust. It is not as flaky as the one with lot of butter. It is still flaky and more like a nice cracker. Baking powder did make it a bit flaky and the wheat germ gives such a nice flavor to it, it tastes great. Me time is must dear but we end up sacrificing it. These are delicious looking cookies perfect for me time. Will make a batch soon. You take care of yourself dear. Very nice post dear:) The pics are to die for... absolutely loved it..
Im a sucker for homemade bars. Lovely clicks as usual. Great recipe for keeps. Thanks for thinking of me Sayantani, I too needed time to focus on my family and getting things settled (still working on that, but I'm taking it easy for now!)) It's lovely to be back, am savoring all the posts I missed! This is my kind of bars.. Lovely pics. Nice and different one..I will try it..